The Portfolio Rebalancing Method has shown that over a long period of time (our back test is over 40 years), a portfolio that used the rebalancing method has outperformed passive buy and hold methods by a quite a large margin. Did it outperform in 2010? 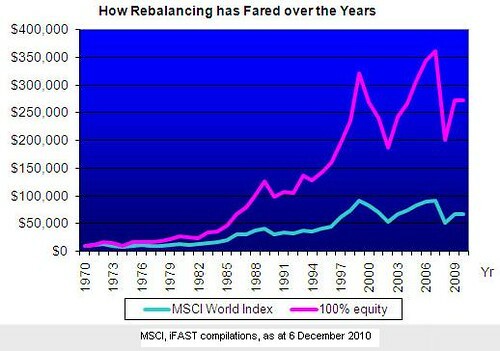 * The rebalancing method has outperformed the MSCI World Index in 2009 and year to date (3rd December 2010). * While rebalancing does not outperform the index every single year, it does enough times over a long time frame that it can significantly outperform the index. We have a long running back test which we have been maintaining for nearly seven years now. This involves the concept of Rebalancing. The rebalancing method has shown that over a long period of time (our back test is over 40 years), a portfolio that used the rebalancing method has outperformed passive buy and hold methods by a quite a large margin. We have updated the numbers for 2010 year to date, and the backtested rebalanced portfolio has continued to outperform. Firstly, just a brief recap on the details of rebalancing and the portfolio we used to test rebalancing through the years. Rebalancing involves setting a fixed portfolio allocation from the very start. So, for example, you set an allocation of 35% into US equities, 20% into Asia equities, 30% into Europe equities, and 15% into Japan equities. Then, at the end of a fixed period like a year, markets would have moved differently. So, you then buy or sell which ever portions needed until you have the same exact allocation again. And this exercise continues faithfully each year for as long as the portfolio is in operation. Basically, what this forces you to do, is to take profit from your best performing sectors/regions, and to invest more into the underperforming regions/sectors that year. It is a mechanical method that disregards what you think of markets. It works on the principle that no single market will ever be best performing all the time through the years, and neither will any single market ever stay down in the dumps every single year. So, as the market cycles go through their rise and falls, the method will eventually result in you buying more of a market when that market is low, and selling some of a market that has gone up sharply. Thus, it ultimately results in an investor buying low and selling high, which is the recipe for a successful portfolio. We will now go over how we actually implemented this into our back tested portfolio over the last 40 years, and what rebalancing forced us to do in the year 2009, and how it fared. Our portfolio is made up of 7 markets represented by their respective market indices. These were allocated based on the following allocation. Now that we have explained the concept, we look at 2010 (already in December) and see how this method would have fared. We used an all equity portfolio split along geographical lines - US, Europe, Japan, and the 4 Asia tigers (Singapore, Taiwan, Hong Kong and Korea). We used the indices S&P 500, MSCI Europe, Nikkei 225 index, Hang Seng Index, Straits Times index, Taiwan Weighted index, Kospi index as proxies for the performance of these markets over the time period. Our initial allocation was US: 35%, Europe 30%, Japan 10%, South Korea: 7.5%, Hong Kong: 7.5%, Singapore 7.5%, and Taiwan 7.5%. We then started rebalancing it all the way from the end of year 1970 to 3rd December 2010, a period of 40 years. From an initial portfolio of $10,000 at the start of 1971, the growth of the portfolio based on rebalancing and compared to a similar portfolio based on the MSCI World all the way until 3rd December 2010 is shown in Chart 1. As you can see, after 40 years, the global portfolio managed using the rebalancing method had grown to $242,697. In comparison, a similar $10,000 portfolio composed of the MSCI World index would have grown to just $59,592. (Both portfolios are in Sing dollars). The difference is significant. As the table shows, the rebalancing method has outperformed the MSCI World index quite handily over the last 40 years. How about over the last few years? The portfolio which used the rebalancing method had outperformed in 2009 as well as year to date. When we looked at some of the actions rebalancing forced us to do in hindsight over the last few years. Here’s some of the highlights. In 2007, the Asian markets were far and away the best performers amongst the 7 markets, and the worst performers were Japan and US. Rebalancing forced us to take profit from Asian markets and add to US and Japan. In 2008, these two markets on a relative basis (especially Japan) dropped less than the Asian markets. Rebalancing then forced us to take money from US and Japan, and add it back into the 4 Asian markets again. And in 2009, true to form, the 4 Asian markets all vastly outperformed US and Japan. The 2010 is almost at a close, and the rebalanced portfolio is set to outperform the MSCI world index for another year. Cumulatively, as it has outperformed the MSCI world index frequently, over the long term, the compounded outperformance on just $10,000 over 40 years has thus resulted in a huge difference between the two portfolios. In conclusion, the rebalancing method has outperformed the MSCI world index in 2009 and year to date (3rd December 2010). While it is not expected to outperform this index every single year, it has managed to do so frequently enough over a long period of time such that the improvement in a portfolio’s gain is quite significant. That is why as we come to the end of the year, investors who are reviewing their portfolio might wish to consider rebalancing if they want a disciplined method that works over the long term. You've bought a .com domain. Great. Ya..having own domain is always better.